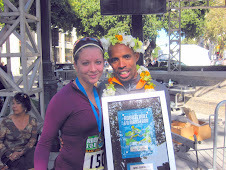 Just received an e-mail saying I will be running the Nike Women's Marathon 10.17.10 I am super excited! This will be my 2nd marathon, the first being NYC in 2002. I was hopelessly unprepared to do it, but somehow managed to finish. Perhaps it was my dad's promise to buy me a crystal apple from Tiffanys with my time inscribed on it that got me through the 26.2 When I complete the NWM I will get a necklace from Tiffanys. Nice how things come full circle!